It is very important that you read the appropriate admissions booklet before making an application, including considering how your child will travel to their preferred school (s). Note that both of these pdf booklets include bookmarks enabling you to jump to each section. Although some web browsers include a bookmark option when displaying pdfs, for the best experience we recommend first saving the pdf to your computer and then opening the file in Adobe Acrobat reader. This will enable you to display the bookmarks alongside the document whilst reading. Selecting the school you would prefer your child to attend is an important decision. The information in this booklet is intended to help you in making that decision. *refers to admission to schools which have first admission at Year 10 – for example the Bristol Technology and Engineering Academy, Digitech Studio School, University Technical College, Bath Studio School and North Somerset Engineering & Technical College. Before completing the application check ‘My Details’ to ensure they are correct and up-to-date. The first screen you will see has the option to either login using your existing login details (assuming you have registered after July 2016) or follow the registration link. It is important any email address used to register should be an email address you have access to and will remain so for the foreseeable future. You can now continue to complete the application form. A guide is available for you. 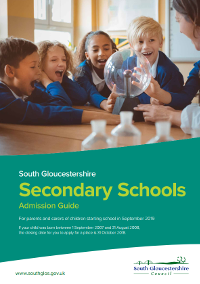 Year 6 pupils who live and go to school in South Gloucestershire should receive a letter, from their current school, before 9 September with their UID number. This can be used to assist the online application. If you are having difficulties getting our system to accept your password and/or email address, please read the following tips before contacting us. Passwords are cAsE sensitive. Also be careful not to confuse for example the figure “1” with a lower case “l”, the figure “0” with the letter “o”. Ensure you provide the same email address that you registered with. If you need to retrieve your password, click the link “Forgotten Password” link below the password box on the Admissions Online homepage. You will be asked to enter the email address and mother’s maiden name as entered in your registration. Your password will be emailed to this email address. Try entering just a few letters of the school name, e.g. han for Hanham Woods Academy, or hel for St Helens and then click the search button. Do I need to complete a paper application form as well as the online form? You should NOT complete a paper form as well. Duplicate forms can cause delays in the application process as additional checks need to be made. Where duplicates are received, the most recently received on time application will be the one processed and any previous applications withdrawn. You may need to complete an additional supplementary form if you apply for a voluntary aided (church) school or foundation school to allow the governors to consider your application in accordance with their admission criteria. Can I change the details on my application form? The application form should be completed showing the address as at the time of application. If you move in the time between first completing the form and the closing date, resubmit your application giving the new address. 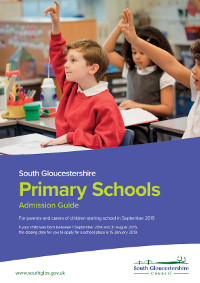 If you move after the closing date, contact the Admissions and Transport Team at South Gloucestershire in writing giving details of your new address so that we can contact you at the correct address. It is the address of the child as at the closing date that determines the priority given to the application for the first round of allocations. How will I learn of the outcome of my application? You will be able to view the outcome of your application by logging on to the website using your password on or after the relevant offer date. A letter giving further details of the offer of a school place will only be sent to those applicants who have not been offered their highest preference and those applicants who have indicated that they wish to receive their offer by 1st class post on the relevant offer date. We cannot respond to telephone enquiries about the school offered until one week after the offer date. Please note that you will only be able to view the outcome of your application online if you have applied online. If you apply by paper application form, you will not be able to view information online.